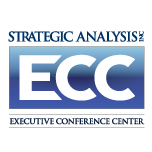 Strategic Analysis, Inc. Executive Conference Center (ECC) is a full service conference venue comprised of over 6,500 square feet of sleek, modern, meeting space designed to serve groups of 10 to 135 attendees. Our facility offers stylish conference rooms, an impressive integrated audio-visual system, high-speed wireless internet access and a dedicated conference facility staff. We are conveniently located in Arlington’s Ballston neighborhood, just three blocks form the Ballston Metro stop, and minutes from Reagan National Airport (DCA). At the ECC, we strive to take the stress away from planning your event. Whether you are a first time planner or a seasoned professional, we work with you to ensure success. We offer daily rental rates that include meeting and pre-function space, meeting room audio visual and wireless internet, all-day beverages with a one hour morning and afternoon refreshment break, and knowledgeable, friendly staff to provide facility and technology support. For more information on rates and availability please visit us on the web at ecc.sainc.com, call us at 703-797-4500 or email us at ecc@sainc.com.